Guest blogger Wendy M. Grossman wonders whether it is right to be optimistic about our digital futures? 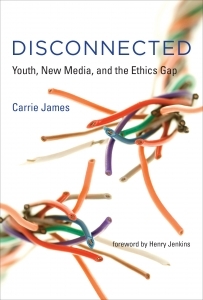 She discusses Carrie James‘ new book Disconnected: youth, new media and the ethics gap in which the author suggests caution, emphasising time for reflection rather than disconnection. 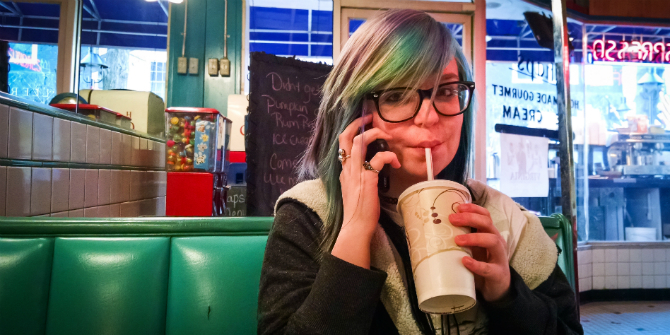 Wendy writes about the border wars between cyberspace and real life. 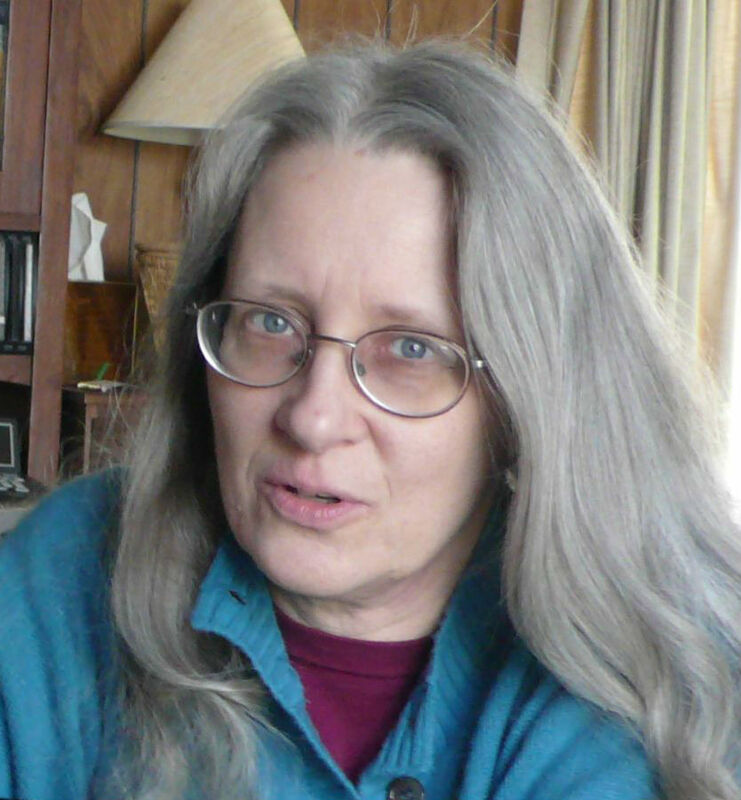 She is the 2013 winner of the Enigma Award and she has released a number of books, articles, and music. Probably every parent in every generation, faced with unfamiliar technologies, asks the question a parent asks in Disconnected: Youth, new media, and the ethics gap: will my child be all right? In James’ book, based on the work of 14 researchers between 2008 and 2012, she tries to answer this question by studying how young people think about the choices they make in their online lives in three main areas: privacy, intellectual property and participation in games and social media. Do ethics figure in their decision-making? In general, she finds that the 103 tweens, teens and young adults interviewed generally take an individualistic view of the moral and ethical dilemmas she asks them to consider, and finds that they often fail to appreciate the wider social impact of their decisions. If you’ve spent much time reading the pronouncements and business plans of Silicon Valley, this sounds like successful colonisation. After all, don’t the owners of companies like Facebook tell everyone that privacy is no longer a social norm? If that’s their firmly held, self-interested belief, their system’s interfaces can make it so. James concludes that what’s needed to create ‘conscientious connectivity’ is better education and better adult role models, but it’s very hard to convince a child not to engage in cyberbullying when they see some of the stuff posted publicly, even by prominent individuals. Technological design also matters, although James herself admits that the practices and policies of internet companies is a blind spot in her book. She also avoids discussing the validity of industry claims surrounding the harms of file-sharing and, to a large extent, the legal consequences of online behaviour. For the latter, albeit under US law, Frederick S. Lane’s 2011 book, Cybertraps for the young, is a better source – he explains the kinds of legal trouble young people can get into online. James, by contrast, wants to understand how young people think. Parents and teachers seeking to guide the young have no chance without that. As 40 adult interviews show, younger people’s reactions are often influenced by adults displaying the same individualistic views. Adults warning of social media privacy risks, for example, tell children to avoid situations where others with cameras may grab and post photos. Adults also advise children not to disclose or to lie about personal details – an effective strategy for protecting your own privacy, but for protecting anyone else’s. Similarly, adult advice focuses on the consequences of online piracy or makes light of appropriation in online spaces with which they’re unfamiliar – when they’re not asking their children how to do it. Some of James’ young interviewees stress the ease of downloading and dismiss the potential financial losses even when they personally know musicians who would object and who struggle to make a living. The copyright section is marred by the contentiousness surrounding the current state of copyright law; many people advocate reform besides those trying to justify downloading. This area has also changed enormously, even since 2012. 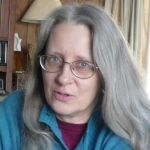 In the areas of privacy, participation and even plagiarism and appropriation, James is right to argue, like danah boyd, that the understanding she develops of behaviour and mindset is valid despite the changing popularity of specific sites. However, the same is not true of downloading music (she doesn’t discuss downloading TV, books or film). As legal services have grown in number, scope and reliability, file-sharing has become less attractive. Napster was beloved by university students in 2000 because there was nothing else. Today they’re likely paying for Spotify, which didn’t launch in the US until 2011. Other complicating factors include the use of digital rights management (which Apple’s iTunes discontinued in 2009), and access to reliable broadband. While James would surely have reported such considerations had her interviewees mentioned them, for those aware of the many disputes in this area, James’ assumption that the ethics of downloading are clear is questionable. The most effective section is the one on privacy, because privacy really is a social construct, yet James finds that adults’ advice is entirely focused on self-protection. It matters little if I choose not to use Facebook (a choice many young people don’t feel they have) if my friends keep posting photographs tagged with my name. In 2011, a Pennsylvania radiology trainee called her sister, also a radiologist, for advice about her supervisor; the sister told a friend, the friend told other friends, one posted the incident to Facebook – and the original student, who wasn’t even on Facebook, got fired. Elsewhere, I have likened this to the network deperimeterisation security people lament – the fact that it’s no longer possible to secure your network by controlling its border. In many areas, James’ young interviewees display conflicting attitudes. ‘It’s only the internet’ jostles for mental space with awareness that one ought to ‘play nice’. The former attitude is, as James notes, well entrenched on the internet from its earliest days. Ultimately, James describes herself as a ‘glass half-empty’: while she shares digital optimists’ hope about the benefits the internet brings to education, citizenship, social interaction and politics, she remains troubled by the frequently seen uncivil and cruel conduct, and its potential to deter many from participating. Unlike many commentators, who seem to believe that the digital pioneers never foresaw today’s issues, she recalls the conclusion of Howard Rheingold’s 2000 book, The virtual community, which expresses exactly these concerns. Like Rheingold, she advocates thought and reflection, things that are hard to come by in this instant-response world.